On this occasion we propose a tour of one of the fashionable neighborhoods of Madrid to this day. We refer to Chueca, an area full of charm and that attracts both foreign travelers and locals, since it brings together many attractions. We think of a journey to please both lovers of art, food, fashion, books, as well as rare and vintage objects. We will walk through its streets, effervescent shops and urban art, reflecting a neighborhood that embraces gay culture with an air of inclusiveness; and we will go into curious and disturbing places that describe it perfectly. Let this be a pretext not only to know those peculiarities of the historical Chueca, but also to share what the contemporary Chueca offers us today, open to all kinds of intrepid travelers. 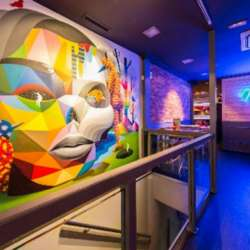 Discover the neighborhood of Chueca that is transforming day by day. Gentrification has allowed Chueca to go from being marginal to have one of the most expensive rent in downtown. LGTB communty has transformed the neighborhood. We will take you to discover the most iconic restaurants, alternative markets, inclusive hotels and original art galleries. Come with us and enjoy a different view of Chueca! We invite you to discover the most secret corner of Surya Callao, Protected content the owners wanted to recreate the era of alcohol prohibition in India, which is still in force in some of its states, such as Guajarat (where they are from). You come to be part of a space free of prejudices, away from prying eyes.